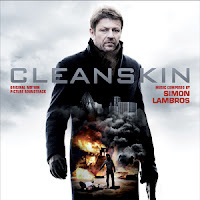 Well received by UK film ciritcs when it was released domestically in March, Hadi Hajaig’s action thriller starring Sean Bean and Charlotte Rampling features an intense and effective orchestral score by the talented Simon Lambros, performed by the Royal Philharmonic Orchestra. It’s a mature and dramatic score that propels action, underlines suspense and provides an emotional backdrop for the story – a score that in terms of style is somewhat akin to such genre works as James Newton Howard’sThe Fugitive and John Powell’s music for the first three Bournemovies. Simon Lambros has written film scores for more than a decade, but this is his first major feature film and a very impressive break-through it is. 5/5 Okay, shoot me... it's a Thriller and guess what it is and you will like it, with a title like Cleanskin you cannot go wrong!